In the notes for the Carnegie (this book is on the shortlist) the first question is: Have you heard the story of the sinking of the Wilhelm Gustloff before reading this book? I have a history degree and an interest in history and historical fiction. My A Level dealt with the Second World War and I have never heard of it. On the 30th January 1945 Germany were just about to lose the war. They were evacuating civilians, wounded men, Nazi officials, nurses and various military personnel from East Prussia before the Russians arrived and killed everyone. The ship was built before the war for German workers to enjoy a cruise on. As a result it was kitted out for pleasure and not as a military carrier. It was also built to carry approx. 1500 people (remember this figure, it will be significant later). Salt to the Sea follows the story of four young people who are all connected to the Wilhelm Gustloff. Joana is from Lithuania and has some nursing experience. She has met up with some refugees who are heading for the coast and hoping to get a ship to Germany. As she has medical experience she has become a naturalised German citizen. She is helping the group, including an old man who is a shoemaker, a young boy who has lost his family, and a blind girl. The shoemaker knows the countryside and is helping them to reach the port and safety. Florian is a German boy escaping from the Nazi art thieves. He is also an expert forger and is carrying a big secret. Emilia meets up with Florian who saves her from being raped by a Russian soldier. She is grateful to him and attaches herself to him as her protector. He isn’t too pleased about this. They meet up with Joana and the larger group and, when they realise they are all heading in the same direction they link up. Not that Florian is very pleased about this either. Then there is Alfred. He is a German sailor who is already on the ship, preparing it for evacuation. He is also a bit crazy. He composes letters to his sweetheart in his head, except it turns out he never writes them, and she isn’t his sweetheart. And he isn’t very nice. I liked his segments though, they were amusing! If you are looking for a light-hearted read then this is not it. The war was brutal, especially during the final few months when the Russians were invading German held territory. Many children, old people and woman were in vulnerable and dangerous positions. Most of the Polish civilian population were drifting after the German occupation in September 1939 and the Polish people had endured terrible hardship. Emilia is from Poland but had been left with a German family. Her story is maybe the most shocking of them all. It is no spoiler to tell you that the Wilhelm Gustloff was hit by three Russian torpedoes in the Baltic Sea in January 1945. The ship had no hospital markings as it had anti aircraft guns fitted and so was seen as a target. It was also in deep water with its lights on to avoid mines. A sitting target. The death toll for the sinking of the Wilhelm Gustloff was 9400. Mostly wounded men, women and children. It was the biggest maritime disaster in WW2 and is not spoken about, even today. What I won’t tell you is what happens to the characters. The way they interlink is good and the various narrators works well. I also enjoyed the way that the author fleshes out the other characters so that we care about what happens to them, the shoemaker and the little boy for example. It is a well written, exciting and life affirming book. The subject matter is obviously disturbing and tragic but it is handled in a sensitive and interesting way. It did also make me go off and do some research about the ship and what happened afterwards. Another terrible disaster in an already terrible war. A good choice for the Carnegie though, and definitely one that I may not have picked up. 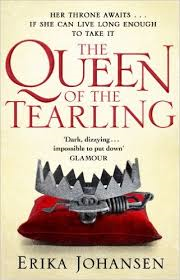 This is a book that I read a couple of years ago and enjoyed, and have just read again for a book group. For me to re read a book is very rare and very annoying because I just sit there thinking of the time I could be spending reading something I haven’t read before so, this is a big commitment for me! Wild boy is a freak. At least, that’s what he has been told his entire life. Abandoned as a baby at the workhouse, he has been kept locked in a room for most of his life. The other boys are afraid of him and the workhouse owner makes money from exhibiting him to curious people. One day, a man called Finch comes to the workhouse and offers the owner a deal; he will pay to take the boy off his hands. He wants him to join his circus in the freak show. Wild Boy notices some things about Finch that Finch wants to keep hidden, and we start to see that Wild Boy is not just strange looking (his body is entirely covered in hair), but has a unique ability to see things that other people cannot. He decides that life in the circus has got to be better than life in the work house and he agrees to go. Thus, his new life begins. The next time we meet Wild Boy he is living in a caravan with a man called Sir Oswald. Sir Oswald lost both of his legs fighting at the battle of Waterloo and is another inhabitant of the freak show. He spends most of his time mending the caravan and looking after Wild Boy. Through a series of mishaps, Wild Boy is out wandering the circus one night when he witnesses a murder after overhearing a conversation about a mysterious machine. He is then embroiled in a fight and accused of being the murderer. He teams up with another kid from the circus Clarissa, who he meets on top of a caravan – they hate each other but soon realise that the only way to solve the murder is to work together. Clarissa is the daughter of the trapeze act and can jump and escape from the most dangerous places, her mother runs the circus but hates her daughter because she looks like the husband who abandoned her. Together they team up to try and solve the murder and work out what the machine is. They meet several strange men who are part of a secret society and begin a game of cat and mouse with the real murderer who is also after the machine and thinks they can lead him to it. 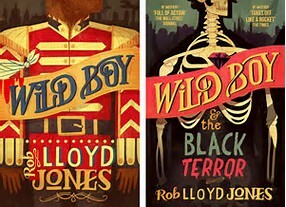 Wild Boy and Clarissa both have unique skills to bring to the table and, together they set about solving the murder and saving London. There is a great twist at the end when we discover who the murderer is and the way is set for a sequel with the two heroes. This is a little bit like Sherlock Holmes. Wild Boy can detect things about a person just be looking at tiny clues that a normal person would not be able to see. The book is set in Victorian London and has some grimy sewer scenes as well, it’s very atmospheric. A great thriller that will keep you guessing who the golden mask man is, who’s the murderer, and what the machine can do. Also look out for the sequel, The Black Terror, I’m not sure if there will be any more but I hope so. This book makes me have conflicting emotions. The main character, Alice, has discovered that she has leukemia and only has months to live. Her childhood friend, Harvey, decides to care for her while hiding his feelings, that he is hopelessly in love with her, even though she has been totally ignoring him for the last couple of years. The trouble is that Alice isn’t very nice. In fact, she is a total user who knows that Harvey is in love with her and will do anything she asks. It all starts with an unfortunate incident where Alice and her boyfriend Luke sneak out of school and go back to Alice’s house. They see something that they weren’t meant to see and Alice swears Luke to secrecy. Unfortunately he is also seeing Alice’s frenemy Celeste and the next day everyone knows. When Alice is diagnosed and realizes that she is not going to make it, she makes a bucket list of revenge. She dumps Luke and gets revenge on both him and Celeste, as well as doing some other stuff like sneaking in to an abandoned camp and smoking pot. Then, the unthinkable happens. Just as she thinks that she is on her last legs and got all the revenge out of her system, a visit to the doctor’s tells her that she has gone in to remission. She no longer has cancer and is going to live. She finds out the night after Harvey has told her that he loves her. She says it back and then realizes that she is not ready for that kind of commitment and panics. As she recovers and goes back to school she starts to ignore poor old Harvey and he is in total turmoil. Then she takes up with another boy (can’t remember his name but it doesn’t matter, he isn’t around for long) and Harvey finds out. He tells her enough is enough and goes off with someone else. I won’t spoil the ending but, suffice to say, I still feel conflicted. Alice is not a nice person. Harvey is a nice person but a total doormat. I don’t think that Alice really cares about anyone except herself, and the problem is that because she is dying everyone thinks they should feel sorry for her. There is a really horrible incident towards the end where the people she has been really mean to get their revenge on her, and I just kind of felt that she deserved it! Anyway, you read it and decide what you think. It’s a good book because it makes you ask yourself whether you would do the same thing in her shoes. If you knew you were dying would you get back at people or would you let the bitterness go and fundraise or something. I like to think I would do good things but, I’m pretty sure I would give some people some home truths as well! But also, just because you think you should feel sorry for someone, if they are as horrible as Alice is, do you still need to be nice to them? This is a quick, enjoyable read. Darcy is the main narrator but there are some sections in italics, not sure who is narrating these, maybe the bear! Anyway, Darcy lives with her mum and dad and her brother Jem in Yellowstone National Park where her dad is working on a research project. They used to live in a proper town but her dad has been offered a position working in the park and has moved them all there, Darcy is not very happy with this. Her mum is also working on some research thing and her brother Jem is older than her and goes to the local high school. She is supposed to be going there too but has been really ill with pneumonia and is off sick. She is recovering and must do a certain amount of exercise every day to build up the strength in her lungs. She goes out one day and starts walking through the snow. She is taken ill and has an encounter with a bear who looks after her. The bear also has something wrong with it and she has a kind of out of body experience. Darcy is also a little bit in love with a boy in her brothers class called Tony Infante. 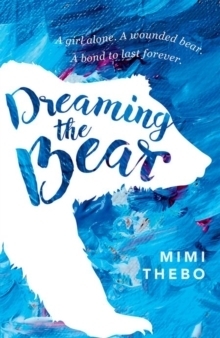 As Darcy struggles with her illness she builds a connection with the bear and she starts to feed her. The bear has an injury in her shoulder and is stuck in a cave up an incline that she can’t get down from. She is also really annoyed with her dad and her mum has gone away to a conference and left them to it. Then a storm hits. Darcy, Jem, Tony and their dad are stuck in their house and all confined to one room. This is a little intimate for Darcy but it means that she can get closer to Tony. After the storm Darcy and her dad go down to town and after a few more trips they realize that when she is down in town she is much better. Eventually one of the research assistants works out the connection. This book is a nice easy read and, although it doesn’t look like much, it is quite enjoyable. It is also on the Carnegie longlist for this year and I can see why. It won’t take you long and that’s quite satisfying! 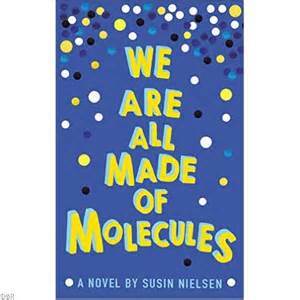 We Are All Made of Molecules was one of the books available as part of the Booktrust box of books, another great selection this year and I read it as part of my book club with year 8. Stewart and his dad live together in their house which, until recently, also contained Stewart’s mum. A year before the book is set, she died. Stewart is a highly intelligent 13 year old and attends the Little Genius School for gifted children. He is very clever. Ashley lives with her mum, her dad lives in a little house in the garden (apparently it’s called a laneway house) because he has decided that he is gay. Ashley is not the brightest button in the box and is mortified by this. She is, as she describes it, at the top of the social ladder and is always worrying about her position on it. She is desperate to keep the fact that her dad is gay a secret. Their worlds collide when Stewart’s dad starts dating Ashley’s mum and they decide to move in together. Stewart and his dad move in with Ashley and her mum and Ashley is super not happy about it. To make things worse (for her) Stewart decides to move from Little Gifted to the same high school as Ashley. Stewart is not the most popular kid in school, but Ashley is the Queen Bee. She resents everything he says and does and doesn’t really want anyone to know that they know each other. Stewart starts to get bullied by the new boy, Jared, and Ashley fancies him. Stewart overhears a conversation about Ashley and decides to help get them together. This will also help with Jared trying to pull Stewart’s shorts down in PE (it must be a boy thing!). Jared is almost as unpleasant as Ashley so they deserve each other. I loved the split narrative of this book. Stewart’s voice was warm and funny, Ashley was horrible and really made me dislike her. I could understand that they both had issues but I felt that Stewart was far more willing to compromise. Ashley was a bit of a spoilt brat. She does get her comeuppance in the end but it still left me thinking that she was horrible. Stewart is obviously on the Autistic spectrum and is very literal. But what a lovely boy he is, and the way he manages his life is really great. This is a fun short read and it will help you appreciate the finer points of families coming together in these situations. It is also a good book club choice as there are a few things to discuss here. Most notably, Ashley and her relationship with her dad and Stewart and his obsession with molecules! You will like Stewart though, he’s one of the good guys.